By 1969, the Office finally had more staff at nine individuals. The approval for this expansion was granted by the then Vice Provost for Students Affairs, Dr. A. Leo Levin. The orientation program, developed not too many years previous was improved and students organizations related to and giving programs on American and foreign student affairs developed. Two publications started as well, one being a newsletter and the other a foreign student magazine. The Office of International Services worked on consolidating priorities and goals with other offices on campus and with local community groups dealing with similar issues. 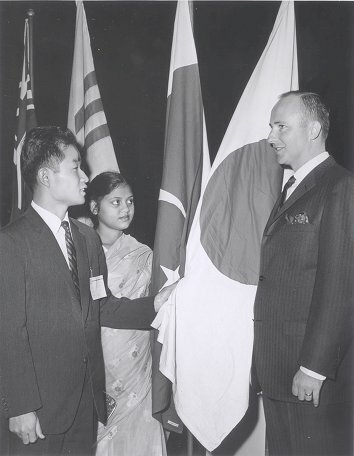 William L. Carr replaced Jack D. Burke (pictured at right with foreign students) as Director in 1966; Carr was replaced by Ambrose C. Davis in the fall of 1970 as the new Director of the Office of International Services. During the economic problems of the 1970s, though, budget cuts hit the office hard and staff was reduced to six. At the same time, and due to the same reasons, many student organizations died. [m]any academic advisors sense the foreign student’s needs and respond accordingly. Some do not. At the graduate level, for instance, most advisors are understandably more concerned with the student’s discipline than his English ability, especially since English proficiency supposedly has been determined prior to admission. What we argue for here is a systematic operation which ensures a minimum uniformity of assistance for every new foreign student; a program which guarantees that no student suffers from his cultural, educational and linguistic background. Ives was also concerned about the varying degrees of foreign students’ abilities in the English language. He mentioned it in the preceding quote, but he went on to request a standardization of the way foreign students be admitted into various departments. Among his arguments was the case whereby a foreign student had been expected to teach an undergraduate class, spoke English poorly and stuttered, and in the end had to leave Penn to another school in the states, while the undergraduate class became annoyed at the University itself. Ives made it clear that although the TOEFL (Test of English as a Foreign Language) scores were received for each foreign student, only some academic departments requested to see them while others never asked for them. Ives wanted English ability to be important when the University of Pennsylvania accepted foreign admissions. Fortunately several years prior to his critique, the English Program for Foreign Students (EPFS), which had originally begun out of the linguistics department, had become full-time since changing its name in 1969. Of course, Ives had critiques for that as well. In 1971, the EPFS stopped reporting to the Vice Provost for Student Affairs and only reported to the Graduate School of Arts and Sciences, and although the EPFS was academic in nature and more of an academic program, it created a separation between EPFS and OIS that Ives wanted to see healed. He also wanted to look to NAFSA (National Association for Foreign Student Affairs) for a consultation on how to improve foreign student admissions, and keep record of how foreign students were progressing in life and in academics at the University of Pennsylvania. He stressed the fact, though, that the Office of International Services, due to little knowledge of the foreign student population’s progress, could only do so much. In the same report, Ives brought up similar concerns with faculty members, citing that the Office of International Services could do more towards aiding faculty with services, many of whom had already been international recognized and were to be participating in faculty exchange. He stressed the need for the Office of International Services to take the initiative and get faculty who were already going abroad to do more in representing the University and meet and make links with other internationally recognized scholars and institutions. 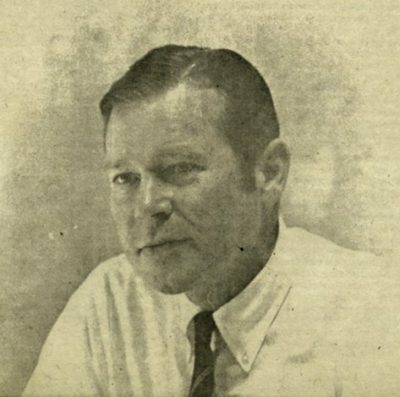 Ives wanted to centralize Penn’s global engagement in the 1970s, and he felt that his office was the key link in the middle, if the University approved his office to do so. By the 1970s, official attitude on study abroad had changed from the aforementioned 1961 report. Study abroad was seen as an educationally enlightening experience. In 1972, Vice Provost Humphrey Tonkin (who would become the Director of the Office of International Programs several years later) wrote a document entitled “The Advancement of Undergraduate Education,” about several issues on internationalization, which at the least promoted large-scale study abroad. The OFIPSA needed to expand to match this growing attitude. Ives’ report specifically cited the need to make the process of approval for study abroad more tolerable and to set up pre- and post-orientation programs for those students going abroad and those returning. Ives made the critique that OIS and OFIPSA should combine their resources, create a new International Center (with lounges and information on international concerns, etc.) and fall under the same reporting process to the Vice Provost for University Life (VPUL). In 1974, James B. Yarnall (pictured at right) was the Director of OFIPSA, then located at 3537 Locust Walk, and was seemingly reluctant to see this happen. Nevertheless, although the International Center was not to be created as Ives had hoped, his idea on combining the offices of OIS and OFIPSA occurred one year later, when the two became the Office of International Programs and coordinated their efforts.